Hello! Last time I wrote about NaNoWriMo Scrivener tips, I mostly talked about dividing your work up and defeating the psychological feeling of defeat that comes when facing a hefty word count goal. This time I have a different target in my sights. We're going to shoot at that pesky inner editor person that's constantly putting your work down. There are two approaches to dealing with the inner editor, and we'll have a look at both of them. First, it's long been a NaNoWriMo tradition to squelch the inner editor; to lock him or her up deep inside you for a month and not let them have a say in anything you do. Scrivener's inline annotations feature can help you accomplish this. If you're the type of writer who hates having imperfect text and you fear leaving it in your work, it can help a lot to specially mark the text in some way, especially a way that's easy to find again later. Inline annotations can be a big help. 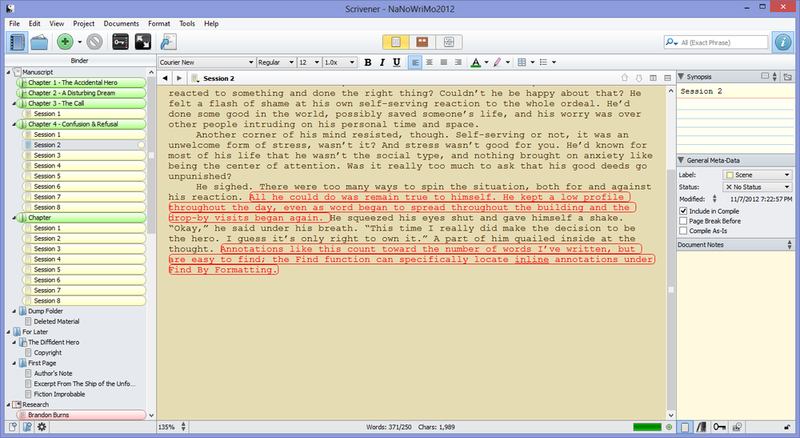 They're bold and colorful (red, in the image above; I believe Mac versions of Scrivener allow you to change the color,) and so they stand out from the rest of your text. You don't have to actually hunt them down manually just by color though. Scrivener's Find command has a Find by Format option, and one of the supported formats is specifically for locating inline annotations. And best still, when you're done your piece, inline annotations are optional when you compile your work into a text file! This means when you do your final compilation to feed to NaNoWriMo.org's word count at the end of the month, all of those annotations count toward your score, but change that option, and you can compile without them. Dump folders aren't so much a feature as a way of working I've developed. A lot of other people do it too, in my experience. You basically set up a folder at the bottom of your main Manuscript folder, and when you want to get rid of stuff like annotations because it's driving you crazy having them remain visible throughout your text, you just cut them out and paste them into the dump folder. The advantage of having one of these is that it keeps your text clean and organized; this is the solution for those who can't completely ignore their Inner Editors. Because the "deleted" text stays in the dump folder, and the dump folder is a part of your project manuscript, it has the same advantage as inline annotations; they do get included in your final NaNoWriMo word count. And because they're all clustered together at the very end of the file, they're pretty easy to remove afterward, too. That's all for now; back to writing! Good luck everyone.